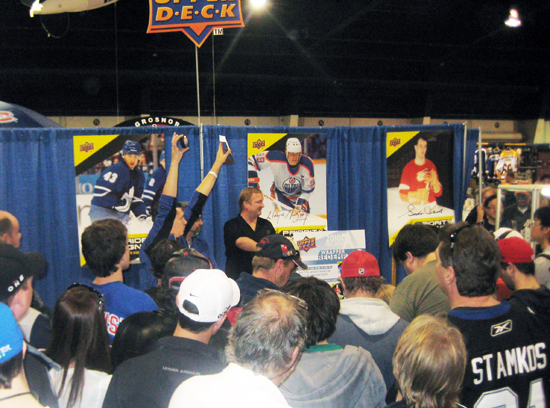 Upper Deck Plans HUGE 25th Anniversary Celebration around the 2014 Fall Expo in Toronto! 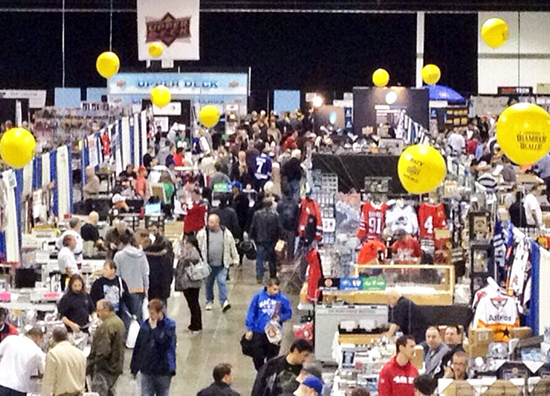 Twice a year hockey fans converge upon Toronto for one of the biggest shows of the year with the Sportscards & Memorabilia Expo. When 2014-15 NHL® Upper Deck Series One releases on November 6, it will mark the 25th consecutive licensed release of the set and we think that is definitely something worth celebrating. Upper Deck will have a major presence at the Fall Expo with some major promotions that fans will want to make sure to be a part of. 25th Anniversary Young Guns Tribute Priority Signings Promotion – Friday at 5:00 p.m., Saturday at 10:00 a.m. & again for Happy Hour at 5:00 p.m. and Sunday at 12:00 p.m.
Purchase one sealed hobby box of 2014-15 NHL® Upper Deck Series One, 2014 Upper Deck Team Canada World Juniors, 2014-15 NHL® Artifacts, 2014-15 NHL® Fleer Ultra or one sealed pack of 2013-14 NHL® Ultimate Collection purchased from a Certified Diamond Dealer at the show. Bring that product along with the voucher you receive from the vendor to the Upper Deck booth and receive a FREE 2014-15 NHL® Upper Deck 25th Anniversary Young Guns Tribute Priority Signings Autograph card at random OR a UDA Rookie memorabilia instant redemption after opening the product there. Priority Signings promotion will only be available during posted hours and while supplies last for each time period. One box per person, per day. Purchase one sealed hobby box of 2014-15 NHL® Upper Deck Series One, 2014 Upper Deck Team Canada World Juniors, 2014-15 NHL® Artifacts, 2014-15 NHL® Fleer Ultra or one sealed pack of 2013-14 NHL® Ultimate Collection purchased from a Certified Diamond Dealer at the show. Bring that product along with the voucher you receive from the vendor to the Upper Deck booth during off hours for the Priority Signings promotion and receive one (1) limited-edition 25th Anniversary Young Guns Tribute Rookie cards at random. Customers who have tins of 2013-14 NHL® The Cup can bring their tins to the Upper Deck booth to open. 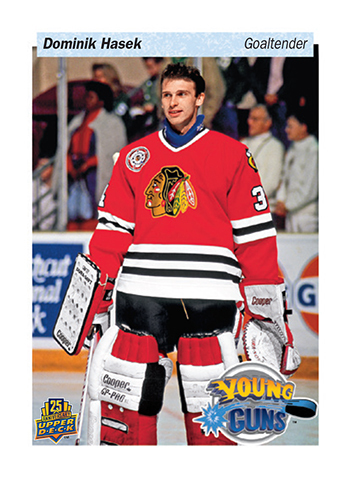 Upper Deck will share one (1) random 25th Anniversary Young Guns Tribute Rookie cards with for doing so at the company’s booth. There is a max of ten redemptions per person, per day on this promotion. Purchase one sealed hobby case of 2014-15 NHL® Artifacts, 2013-14 NHL® Ultimate Collection or 2013-14 NHL® SP Authentic and receive two (2) FREE 2014-15 NHL Upper Deck 25th Anniversary Young Guns Tribute Priority Signings Autograph card at random OR a UDA memorabilia instant redemption and a bonus instant premium redemption item. Participating collectors will also receive a FREE Upper Deck 25th Anniversary toque. Promotion is open at any time and while supplies last. One per person, per day. Bring two sealed packs of 2014-15 NHL® O-Pee-Chee or MVP at the UD booth at any time and get a FREE Upper Deck personalized 25th Anniversary Young Guns card! Upper Deck will have a professional photographer to take photos of fans and print an actual Upper Deck 25th Anniversary Young Guns cards for fans on site. For just two packs of 14-15 NHL O-Pee-Chee of MVP you could get your very own Upper Deck card made! Purchase two (2) sealed hobby boxes of 2014 Upper Deck CFL and receive a limited-edition 2014 Upper Deck CFL uncut sheet. 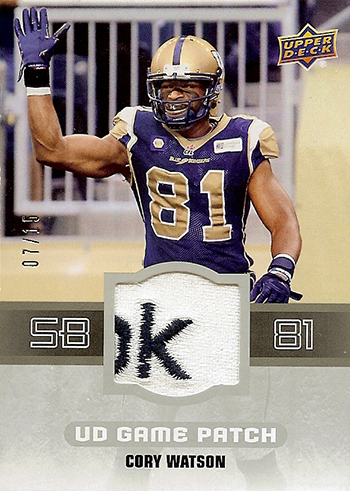 The premier edition of Upper Deck’s Canadian Football League set is sure to be a collector’s item and these uncut sheets will certainly make for an incredible collectible! Upper Deck will be hosting a variety of other compelling programs around the company’s anniversary for the Fall Expo as well. Take a look! Step right up and test your hockey skills at the Lights Out hockey game where Upper Deck will have a variety of prizes available for top shooters. The game is FREE to play!!! FREE Givaways! – All Day Friday, Saturday at 12:30 p.m. and Sunday at 2:00 p.m.
What is better than FREE? Celebrate 25 year of Upper Deck Hockey with a variety of giveaways throughout the weekend! 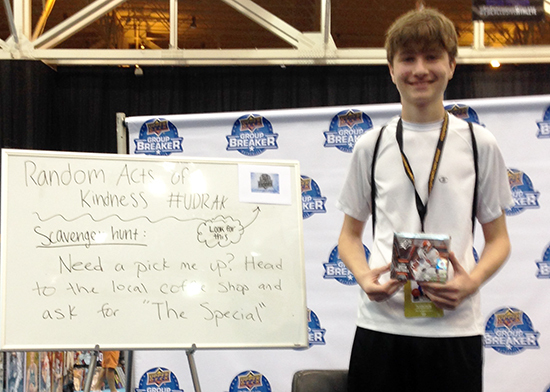 Upper Deck Random Acts of Kindness Scavenger Hunt – Collectors have enjoyed Upper Deck’s Random Acts of Kindness program and we will bring the excitement around that event to the 2014 Fall Expo on Friday. Upper Deck will hide 25 sealed Random Acts of Kindness envelopes throughout the Convention Center and share clues at the company’s corporate booth throughout the day. Lucky collectors who track them down can score sweet prizes like apparel and product! Collectors can only bring one redeemable envelop to the Upper Deck booth that day. Free Raffles – Stop by the Upper Deck booth at 12:30 p.m. on Saturday and again at 2:00 p.m. on Sunday to secure a free raffle ticket to score some exciting prizes that you won’t want to miss. No purchase necessary! Upper Deck raffles at the Expo are always a BIG draw! Expired Redemption Raffle – Submit your expired modern-day UD redemption cards until Saturday at 1:30 p.m. Raffle will take place to 2:30 p.m. Here is your chance to score some cool items for your expired redemption modern day redemption cards. Check out details on UD’s Expired Redemption Raffle! Ryan King from Upper Deck Authenticated will be on site offering fans incredible show specials on the world’s best memorabilia. Fans can purchase incredibly collectibles available at the show from company spokesmen like Wayne Gretzky, LeBron James, Michael Jordan, Tiger Woods and Rory McIlory. Ryan will also have a variety of current NHL player product available that you will definitely want to add to your collection, make sure to stop by and chat with him. Tim Carroll is an incredible artist who takes trading cards, cuts them up and creates works of art with him. 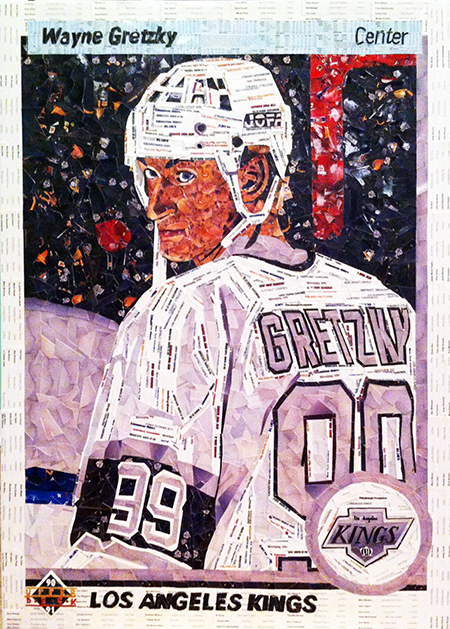 Fans marveled at his incredible Wayne Gretzky mosaic he created and Tim will be on hand to talk about his process with fans while creating another incredible work of art live! Welcome Reception – Friday night from 8:00-9:00 p.m.
Friday night Upper Deck’s staff from product development and marketing will be sharing plans for upcoming products and programs at a special welcome event. Loyal Upper Deck fans and dealers are welcome to attend by emailing UpperDeckMarketing@upperdeck.com with their full name, address, phone number, favorite team and why they want to be a part of this event. Upper Deck will review and send confirmation emails to those cleared to attend. Upper Deck is proud to announce sponsor Kids Day at the Expo where kids between the ages of 6-12 can get into the show for FREE! Additionally, kids will get a special voucher they can bring to the Upper Deck booth to receive a special Hockey card!! Upper Deck Goes Looney For Movember! Upper Deck wants to encourage fans to give to a great cause during the 2014 Fall Expo so the company will be accepting donations in the form of $1 coins (affectionately known as “loonies” in Canada) that will be donated to Movember Canada. All proceeds go to this worthwhile organization that encourages men to grow mustaches during the month of November to raise awareness (and funds) for men’s health programs. Every fan who makes a donation will receive a FREE mustache to help celebrate Movember! If you are tweeting or posting images to Instagram from the 2014 Fall Sportscard & Memorabilia Expo use hashtag #FallExpo for the show and #UpperDeck25 to share any cool UD Anniversary experience or items you received. 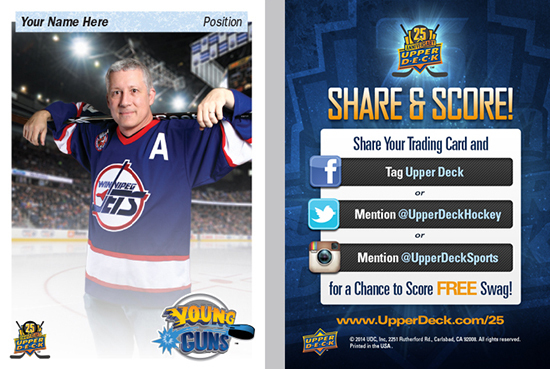 On Twitter make sure you are following @UpperDeckHockey and @UpperDeckSports! On Instagram, watch for images from UD by following @upperdecksports! And give the show a follow on Twitter at @sportcardexpo! When is the show in Toronto? What dates? Looks like an interesting Expo! Disappointed that Series 1 will not be included in the Case Break promotion though. Also missing Crosby, MacKinnon and Stamkos content. 3 of the games biggest stars. Enjoyed participating in the Case Break promotion the last couple of years, but think I will have to bypass this one. WOWZA Can’t Wait Upper Deck!!! you have stepped up the hockey game a huuuuuuuge step, Thanks A Lot And I Am Exicited To See You Guys There!!!!!!!!!! I buy multiple cases (10+) of Series 1 every year, this was the first year I was going to take advantage of the case break promotion at the Fall Expo. Why was the promotion taken away? Kevin, the show is November 7-9 in Toronto. Eric, we ran UD1 cases as a test last year with 25 items and it didn’t work very well so we are only making UD1 available for the box breaker promotion. The main reasons were we had resellers/dealers taking part in it trying to build team sets and we want the focus to be on the collector at these events. Additionally, it takes a long time to break a case of UD1 so that backlogged things and provided a less than ideal experience. The regular Priority Signings promotion is catered perfectly for UD1. Thanks Chris, appreciate the reply. I can understand that it does take an hour per case to open. Disappointing from my perspective and how much I continue to invest in UD products, but I can understand the issues you have described above as well. The Expo is a great show for any Hockey collector, And UPPERDECK just makes it that much better. Good time with New and old friends.